Thanks to Oakland based photographer, Malaika Kambon for these excellent ring side photos of the Andre Ward – Carl Froch fight in which the winner Andre Ward took the Super Six title. 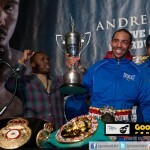 ATLANTIC CITY, N.J. (Dec. 18, 2011) – Andre Ward is the Super Six World Boxing Classic champion and the No. 1 super middleweight in the world. Ward dominated England’s Carl Froch to win a unanimous decision by the scores of 118-110, 115-113 two times in front of 5,626 at Boardwalk Hall in Atlantic City, N.J. The victory unified the World Boxing Association and World Boxing Council super middleweight titles and also earned Ward The Ring Magazine belt as well as the inaugural Super Six World Boxing Classic cup. A frontrunner for Fighter of the Year, Oakland, California’s Ward (25-0, 13 KOs) scored an impressive victory, which has anointed him as the man to beat at 168 pounds. After the hard-fought unification bout, Ward had one word for his impressive evening and undefeated run through the two-plus year tournament: “Supernatural”. 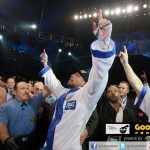 Ward was more than a little bit better and proved once again that he can fight any type of fight and win convincingly. Despite being the faster, slicker boxer, Ward stayed in the pocket at many times throughout The Final and exchanged with the heavy-hitting Froch. However, Ward also displayed his superior defense and boxing ability. Ward was too quick for Froch. 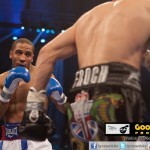 Froch (28-2, 20 KOs) seemed tight throughout the fight and frustrated by Ward’s ability to slip punches. After the final bell of the Super Six World Boxing Classic rang, Ward raised his hands in victory when judge John Keane (United Kingdom) awarded him the bout 118-110 and both Craig Metcalfe (Canada) and John Stewart (United States) scored the 12-rounder for Ward at 115-113. Ward’s arduous journey through the Super Six tournament included dominant victories over former champion Mikkel Kessler (TD11), Allan Green (UD12), Arthur Abraham (UD12) and Froch (UD12). For Froch, the tournament provided mostly ups but some significant downs. 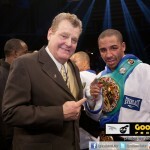 He scored a split decision win over Andre Dirrell before losing his WBC title in a unanimous decision loss to Kessler. He rebounded by winning back the vacant WBC belt by unanimous decision over Abraham and then scored a majority decision victory over Glen Johnson in the Semifinals. What either fighter will do next is uncertain – but tonight’s culminating bout provided certainty in the division. As SHOWTIME intended when the network launched the tournament, the Super Six World Boxing Classic has determined the No. 1 super middleweight in the world. And that man is Andre Ward. The event was promoted by Goossen Tutor Promotions, Matchroom Sport and Antonio Leonard Promotions, in association with Caesars Atlantic City and sponsored by Corona.